Today’s lesson from Mark of Jesus teaching at the synagogue and healing the man with the unclean Spirit is actually the lectionary text for next Sunday. 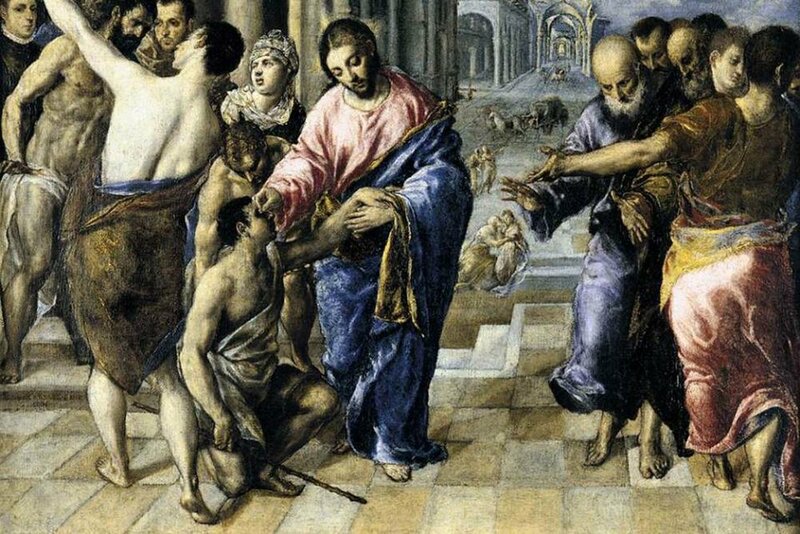 The lesson for this Sunday is the verses just before these of Jesus calling his first disciples, but I decided to flip flip them because there’s something about this story of Jesus healing a man who’s demon processed that seemed appropriate for a Deacon Ordination. This is Jesus first public act after calling his disciples. They’ve come into Capernaum, and Jesus begins to teach and has captivated the congregation gathered there at the synagogue. And they’re all locked in on him as he’s expounding upon the scripture, opening them up in a way they’ve never heard—speaking with an authority they’ve never encountered. It’s spellbinding and heart-warming and mind-blowing and right as he’s getting to his final point and they’re all on the edge of their seats, holding in their breath, from the back of the synagogue they hear someone yelling—and the moment is ruined. They know exactly who it is. It’s the man with the unclean spirit who screams and drools and convulses, who’s supposed to stay outside with so many others who are deemed disruptive to the work of God taking place inside. As Mark tells it, this is where Jesus ministry began: with this very public, very awkward, very tense act of healing, of this nameless, faceless, very sick man whom everyone else had hoped would stay away, back wherever it was that he came from. And yet against all this the man steps out of the shadows. And we’re not told just what led him out of the shadows. I suppose I’ve always assumed it was his demons that led him out to confront Jesus. But it occurred to me this week if perhaps instead the man was able to muster the strength to fight through his demons enough to make his way to Jesus, knowing that he needed healing, and putting all his hope in the wild idea that stepping into the presence of Jesus would do it. If you grew up in the church—and probably even if you didn’t—you have a notion of what “Sunday best” means. Your church clothes, your church shoes—our boys know just what shoes these are; they’re little saddle oxfords that their grandparents have been making sure they had since they were old enough to wear shoes. If you’re like me it was engrained in us from an early age what was acceptable to bring to the church and what was not—that a certain level of effort was to be extended, a certain polish was required: “Your Sunday best.” And don’t get me wrong, this isn’t all bad and I think there’s probably a lot of good to be found in this idea of offering to God our best and so forth. Although if the best you have to offer God is your saddle oxfords, we’ve got a problem! But it’s also true that this notion tends to reinforce the belief both within and perhaps especially outside the church that church is, as a friend of mine puts it, ultimately a gathering for those whose lives are well-scrubbed. Which of course we in the church know isn’t true. Or at least, we know it isn’t true of us. We know our stains, our blemishes. Our demons. That same friend, Alan Sherouse, who’s pastor of the First Baptist Church in Greensboro, North Carolina, said once, “What if instead of Sunday best, we tried Sunday honest?” Would that help us remember that we don’t approach Jesus as people who are whole, but as people who are broken? People who need a little scrubbing. People who are wounded and in need of healing. People with demons. And not just some of us, but all of us. And what if the church were truly a place where this kind of honesty before God and each other was not only encouraged, but expected? What would it take to be that kind of church? Which brings us to the today’s service of ordination and installation. The office of deacon is one of two ordained offices in the Baptist tradition, the other being that of pastor. It’s also the oldest calling in the church, probably even predating the pastorate, and from the very earliest records of the church is defined by service to others. The book of Acts tells us that as the early church was growing by leaps and bounds, the apostles were finding that they were unable to meet all the needs of their expanding congregation, specifically the distribution of food and other goods to the most vulnerable among them. And so they came together and appointed leaders from among the congregation to administer these acts of service to the church and the community. Paul would later call these servant leaders diakonos, from which we get the word deacon, at it means “servant,” plain and simple. Deacons, from the very beginning of the church, have been those within the congregation called to the humble but holy work of caring for the needs of others, and in so doing reminding us that in this peculiar new creation we claim is springing forth in the world and even dare we say it within ourselves, the humble is the holy. But of course, despite these origins, the office of deacon has come to mean different things to different people and different churches. In many churches, as you know, the office of deacon is reserved for men only, but it was this service of ordination 32 years ago, in January of 1986, that our church ordained our first women deacons. Fast forward to this year when a majority of our deacons are women. In many, if not most, Baptist churches, the deacons serve as the church’s authoritative body in matters of policy and business. But way back in 1978 our church took on a different model of church leadership. It was at that time that the Church Council, made up of elected positions and chairpersons of the major committees and groups within the church, became the primary decision-making body for the church, and the deacons devoted themselves—in the words of Rollin Armour in our history book—“to the work of Christian ministry,” visiting the sick, caring for an assigned number of families in the congregation, and working with the ministerial staff to attend to the needs of the congregation in any way they could. And understand this wasn’t and isn’t meant to dilute the importance of deacons or diminish their role in the church. If anything, it was meant to elevate it, because in our mind it brings the role of deacon back to its New Testament roots as servant leaders. And yet, even with this change in focus, many unfortunate images of what a deacon is or should look like, or how they should act or not act and so, forth still persist. Deacons are the definition of Sunday best. They’re well-scrubbed and they have well-scrubbed children. You know the image I’m describing. And so many folks, when they first learn that the congregation has nominated them to become a deacon, have feelings of inadequacy. From time to time they may suffer from the “if only’s.” If only they knew this about me, or that, they wouldn’t have called me. To this class, as we say each year, if you’ve found yourself wondering this, let me assure you that there has been no mistake. You have been called because you have modeled, each in your own way, what it means to serve in the name and way of Christ and your capacity to lead and inspire others. And again as we say each year, understand that in our calling you as deacons—just as with pastors—we’re not claiming to bestow any special gifts or powers upon you. In calling you as deacons, we’re simply naming in front of God, each other the gifts we already see in you. You each already minister to so many, often in small, mostly unseen ways. Each of you has given generously of your time and energy, prayers and resources. We know you and love you, and have already been served and challenged and inspired by you. And so my charge to you is nothing more than to keep doing what you're doing and being who you’re being, only now, do and be knowing that you have not only the blessing of God, but the blessing of your church. Don’t feel as if this means you always need to have on, you need to be at your Sunday best. What we need you to lead us in is the work of being Sunday honest: Sunday honest about ourselves and the world; about the work of the church, and the calling of God for us in the present moment. That’s what we need, and it’s what we’ve called you to lead us in doing. And to the congregation. As you come forward and lay hands on these brothers and sisters, may this not be the last or the only time you bless them. Remember that in calling deacons we’re not naming folks to be good Christians for the rest of us; folks to be well-scrubbed to our standards. Yes, we’re calling them to lead, but they can only do that if we commit ourselves to follow, or better yet, to travel together.